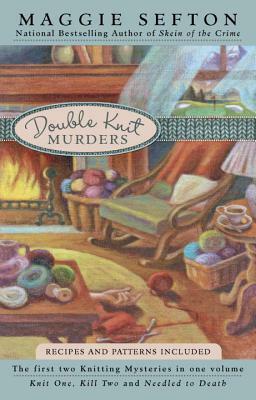 The first two books in the national bestselling Knitting mysteries- Knit One, Kill Two and Needled to Death. In Knit One, Kill Two, Kelly Flynn returns to Colorado for her aunt's funeral only to suspect that the woman's death was not an accident. With the help of the knitting regulars at House of Lambspun, Kelly's about to get a few lessons in creating a sumptuously colored scarf-and in luring a killer out of hiding. In Needled to Death, Kelly visits her friend Vickie's alpaca farm, and finds her splayed out on her original hand-woven rug, blood seeping into the design. Kelly can't resist investigating-even if it means taking a break from the sweater she's been knitting in the round. Maggie Sefton is the author of the New York Times bestselling Knitting Mysteries. She was born and raised in northern Virginia, where she received her bachelor’s degree in English literature and journalism. While Sefton has worked as both a CPA and a real estate broker, she feels that neither of those endeavors compare to the challenge of creating worlds on paper. She is the mother of four grown daughters, currently scattered around the globe, and resides in the Rocky Mountains of Colorado with two very demanding dogs.